We’ve now compiled the results from the survey and wanted to circle back around and let you know what we learned. 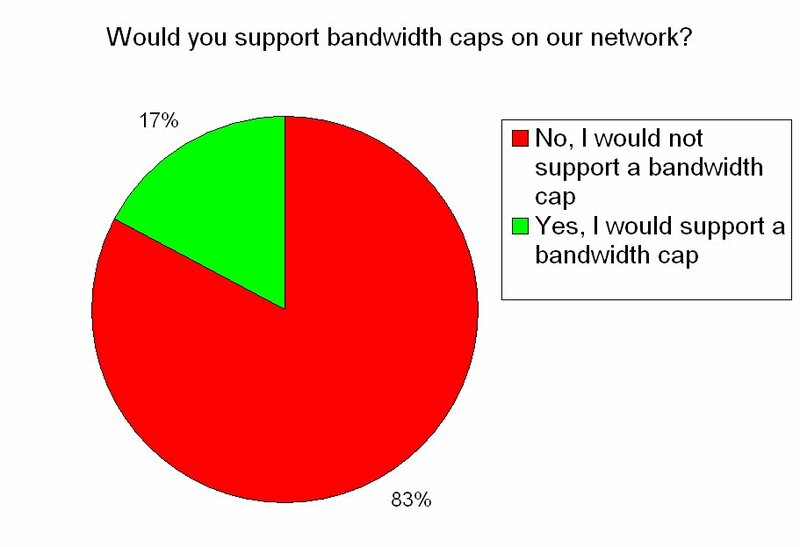 First off, 83% of our members do not support a bandwidth cap. Secondly, 82% of our members would rather have a flat rate, best effort service than a tiered service. Finally, though the company as a whole is eking out a modest profit, when we separated the profits from our software development and hosting business from the Internet Service Provider (ISP) side of the business, we found that the ISP is incurring substantial losses each and every month. With these three items in mind, we’ve looked at our existing offerings and adjusted our prices to be more inline with our costs and our competition. Throughout this process we have kept our customer’s preferences in mind. We plan to continue to operate the network with no bandwidth caps and flat rate pricing. Service will continue to be offered on a best effort basis. That means you’ll get the best speeds and latencies that we can offer at your location. No artificial caps and no tiered services. We will, however, continue to use our egregious user software to manage network traffic for the benefit of the most possible users. We are, however, going to be separating our services based on how they are delivered. We feel it is fundamentally unfair to charge someone with a WiFi only connection the same rate as someone with a 1 Gbps fiber link. All prices below are based on publicly posted prices retrieved from the respective company websites on November 5, 2012. In an attempt to compare apples to apples, these prices do not include fall-off rates, bundled services or promotions. We have also included modem rental in both ours and our competition's prices. These are by no means a comprehensive listing of our competitor’s prices and services. Customers who wish to know more about our competitors products and pricing should contact them directly. We hope that you’ll understand why we have had to make these changes. We really have held prices down over the past 5 years as much as has been possible. In the past 4 years network traffic has grown by over 1,000%, while our pricing has only increased 30%. Our members are using more and more Netflix, Hulu & YouTube. Expanding capacity to meet this demand has been, and continues to be, very expensive. Our basic service currently serves customers without equipment. These customers connect to our WiFi network receive a very convenient, but less reliable service. Speeds can range from 12 Mbps down to 128Kbps depending on how close the customer is to the nearest node, network congestion, local interference and other factors. We’ve decided to keep this service as inexpensive as possible. Prices for our basic service will go from $28.98 to $37.98. Our advanced service includes professional grade equipment and/or a dish or panel antenna on the outside of the home. 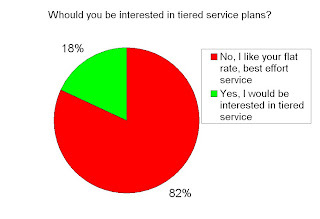 This service is substantially more reliable than our basic service. In some areas where customers are connected directly to a tower they are getting speeds of up to 20 Mbps. We are going to keep the prices for this service in line with the mid-tier services provided by the cable and phone company. Prices for our advanced service will change from $35.98 to $47.98. We are also going to unify our rural service with our advanced service. This will change our rural rates from $44.98 to $47.98. Our business service is delivered either on fiber-optic cable or on directional panel antennas. Business customer connections are monitored 24/7 and businesses receive expedited services during business hours. Many business customers get 20, 30 or even 50 Mbps of real throughput on their wireless links. Added to this are upload speeds that dwarf the speeds of other service providers. With this in mind, we are going to change our business service pricing from $49.98/Mbps to $59.98/Mbps of guaranteed throughput. As always, for each Mbps of guaranteed throughput, we will provide an additional 9 Mbps of best effort service. That means a businesses 2 Mbps link can burst to 20Mbps when conditions allow, which is most of the time. In this case we were unable to locate printed versions of our competitor’s prices, which tells you a lot about their business practices. The prices below were provided by sales representatives. Didn’t respond in time for print. Says something…..
On Jan 1 we are going to be launching a competition between various neighborhoods to become the first Wicked Broadband Fiberhood in Lawrence. Much like Google’s approach in Kansas City, neighbors will be able to pre-register for service in their neighborhood. Areas with the highest subscription will be built out first, with the goal of bringing the first neighborhoods online by March 1. Our fiber service will demark in the home using two physical mediums. 100 Mbps and 1 Gpbs. Initial installation will be the same price for each service, $200 with a 1 year commitment, or $750 with no commitment. If the customer chooses to have service delivered on 100 Mbps medium, we will be charging $70/Mo. If the customer chooses to have service delivered on 1 Gbps medium, we will be charging $150/Mo. New pricing will take effect on December 1, 2012. We value your membership in our network and hope that we’ll have the opportunity to continue serving you in the future.